This 7300 square foot garden has two distinct areas - the 'Edible' Garden and the Water Wise Garden. The former demonstrates edible landscaping using a wide variety of seasonal vegetables, fruits, and flowers, while the latter showcases beautiful landscaping with low water plants. Directions: The Palo Alto Demonstration Garden (PADG) is located at Eleanor Pardee Community Gardens, on Center Road near Martin Street. Visiting hours: The 'Edible' Garden is open to the public on the first Saturday of every month when we hold free workshops (10:00–11:00 a.m.) with an open garden afterward. Our work day is on Mondays from 10:00 a.m.–noon when we also are available to answer questions and give tours. The garden may be viewed over the fence when not open. The Water Wise Garden is open dawn to dusk. The enclosed area for edible plantings covers one-half of the PADG area. This garden displays innovative approaches to edible landscaping, with seasonally appropriate vegetable and fruit selections. 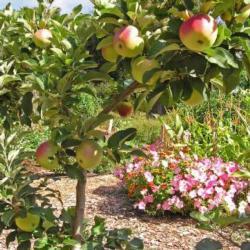 Presenting a set of horticultural "best practices" for home gardens, the beds illustrate the use of proper soil preparation, trellising, staking, efficient irrigation practices as well as a variety of vegetable choices. This garden serves as a showcase for new garden varieties, cover crops, rare fruits, and flowering plants that attract beneficial insects. 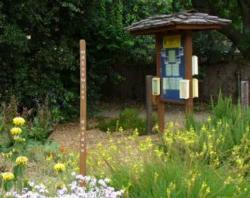 The Water Wise Garden (always open to the public) demonstrates how native California and Mediterranean climate plants can be used to create a beautiful, low water, natural garden. Once established, the plants in this garden require little or no supplemental summer water and provide food and shelter for beneficial insects, butterflies and birds. The diversity of plants and the presence of the beneficial insects keeps the garden healthy without the use of pesticides. The mulch on the beds helps reduce water evaporation and breaks down slowly releasing nutrients for the plants. The pathways have had a layer of cardboard then mulch to retard the growth of weeds. 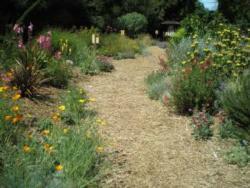 On mulched pathways, visitors can meander among six areas and enjoy the huge variety of plants. Each of the beds (Long Border, California Native, Dry Creek, Three Rocks, Boomerang, and Edges of the Garden) has its own distinct plant groupings as well as common plants that tie the garden together. There is signage throughout the garden, plus lists are available at the entry kiosk of all the plants and their locations. See our Water Wise Plants page to browse the plants featured in our garden or to search for plants to suit your own landscaping needs.